Enterprises are adopting AWS Lambda faster than competing serverless platforms from Google, Microsoft, IBM and others, citing ease of use to replace manual with automated functions and the broad reach of AWS services. AWS Lambda — an event-driven automation platform — owns 70% percent of the active serverless platform user base, according to a survey by the Cloud Native Computing Foundation. By comparison, the nearest competitors’ shares were much lower, with Google Cloud Functions at 13 percent and Microsoft Azure Functions and Apache/IBM OpenWhisk at 12%. Amazon released the AWS Lambda serverless platform in 2014, while the above-mentioned competing products came out in 2016. In that between time, AWS made hay while the sun shone. 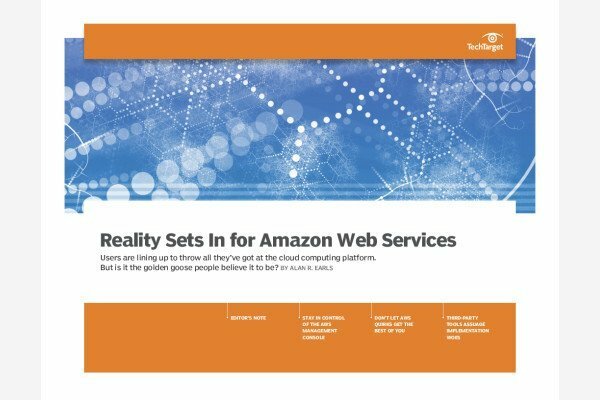 “AWS really got people to pay attention to Lambda and — unusually for enterprises — start using it quickly,” said Daryl Plummer, managing VP and chief of research at Gartner in Atlanta, Ga. Enterprises’ prototype phases for Lambda shortened to a few weeks from what is usually a months-long process, said AWS technology evangelist Jeff Barr. Attendees at an AWS Summit in San Francisco last week cited their reasons to embrace AWS Lambda. Matthew Stanwick, systems analyst at Sony Network Entertainment International in San Diego, CA, said he finds it easier to script and deploy simple tests and terminate cloud instances. “I can build tests right there on the console with no problem,” he said. Amazon doesn’t have any particular advantage in serverless beyond competitors Google, Microsoft or IBM, but it has better promoted Lambda’s ease of use and an overall services portfolio that support serverless, said Plummer. For example, Lambda hides some of the more complex mechanisms such as Amazon EC2, upscaling and downscaling and VM management, and it can be used as a front end to facilities like S3 or CloudFront caching for content delivery. “In short, anything that AWS does can be made easier and front-ended by Lambda,” he said. AWS also quickly connected Lambda to many different event sources, Barr said. “People started to think of it as this nervous system they could connect up to the incoming flow of data into S3, to message queues and to notifications that are wired into different parts of the AWS infrastructure,” he said. At its release, AWS Lambda was made a part of the platform structure behind the Alexa Voice Service, and that gave developers a practical place to try out serverless. “Developers can deliver functions and be responsive without having to rebuild the platform itself,” Plummer said. Alexa skill code can be released as a AWS Lambda function that, typically, enables voice-activated activities. Software actions or natural world events also can generate events. For example, a request for the time can trigger a time function embedded in the interaction model for Alexa. Lambda’s serverless support of the AWS family of services makes is less risky than investments to build a serverless architecture, said Clay Smith, developer advocate at New Relic. People can run experiments with it, such as DevOps automation tests, and if these small ventures don’t succeed they’ve only paid for usage time, he said. Right now, serverless platforms are still more of a sideshow, Plummer said. But soon vendors will deliver more and more critical functions to make the technology more robust, and usage will spread. Eventually, everyone will have a serverless platform beneath their newest applications, to provide flexibility for the people-centric workloads d built today, he said.